Last week a structural breakout in AUD/USD was confirmed. Whether you trade currencies or not, it’s worth paying attention to because of its implications from an inter-market perspective. Precious metals are a sensitive subject in some circles. Discussions about gold or silver tend to bring out more anger and craziness than other assets. As someone who couldn’t care less about what we’re trading, Gold, Apple, Bonds, Australian Dollars or Go Pro, to me it’s just letters and math. I find it kind of funny when people get extra sensitive about a specific asset. Precious metals bring out some of the most hilarious commentary. Another quarter in the books amigos. Dr. Phil and I took a look at some longer term charts, as is always a good idea at the end of months and quarters. We’ve got some big time assets at some big time levels – stocks and treasury bonds specifically. 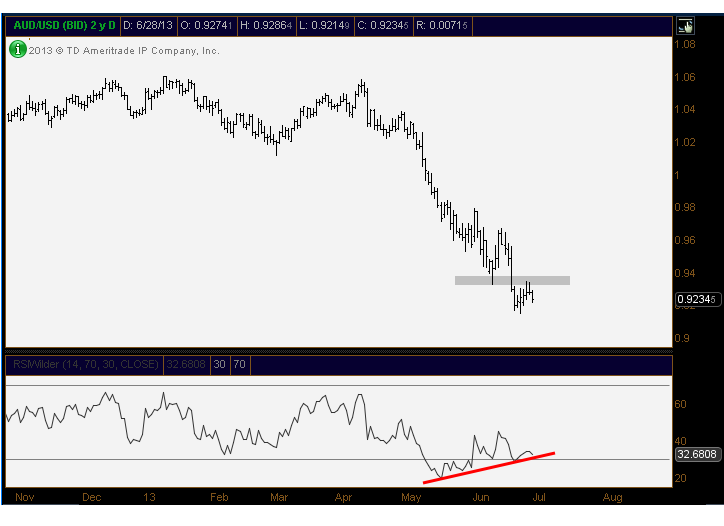 Aussie Dollar, as we mentioned this week has not confirmed these bullish momentum divergences. And I figured it would be a good time to follow up on the Gold/Platinum Ratio that we’ve been talking about since December – new 52-week highs today. This Aussie Dollar is really interesting here. There are reasons to be bullish, fine. But the consequences of these levels not being the bottom are….wait for it….wait for it…Goldilicious. Here’s what I mean. Two weeks ago, I was explaining to you guys how there was a nice bullish divergence developing in gold miners. But we weren’t getting any confirmation from price. And it was taking forever. So I pointed out how the consequences of gold miners not finding a bottom there with that bullish divergence in place would be devastating. And sure enough, they rolled over and the crash has continued. We still haven’t gotten that bounce. Prices haven’t confirmed this divergence. And like gold miners a couple of weeks ago, it’s taking forever. So if this isn’t the bottom, I would say that Aussie is in serious serious trouble. And I don’t mean a slight pull back either. I mean gold type moves coming in this thing if it can’t find a bottom right here. Take a look at how much downside aussie has on the weekly chart. It’s no joke.